I have always loved Valentines. As a little girl, I remember Valentine boxes in school and little envelopes with colorful cards from friends. I also remember being fascinated by beautiful older Valentines at antique stores. When I first opened an eBay store, it was all vintage children's books, which I love. Eventually I added in vintage holiday cards (especially Valentine's Day, Christmas, and Easter). I really enjoy working with vintage holiday cards at Birdhouse Books. Buyers love them because they are fun to frame, great for unique crafts, and a sweet, unique gift tucked into a greeting card. I offer combined shipping for all my vintage cards, and have a huge assortment: Vintage Valentines at Birdhouse Books. I am hosting a vintage Valentine giveaway ending Friday, January 23. Entry is easy with the Rafflecopter form below. 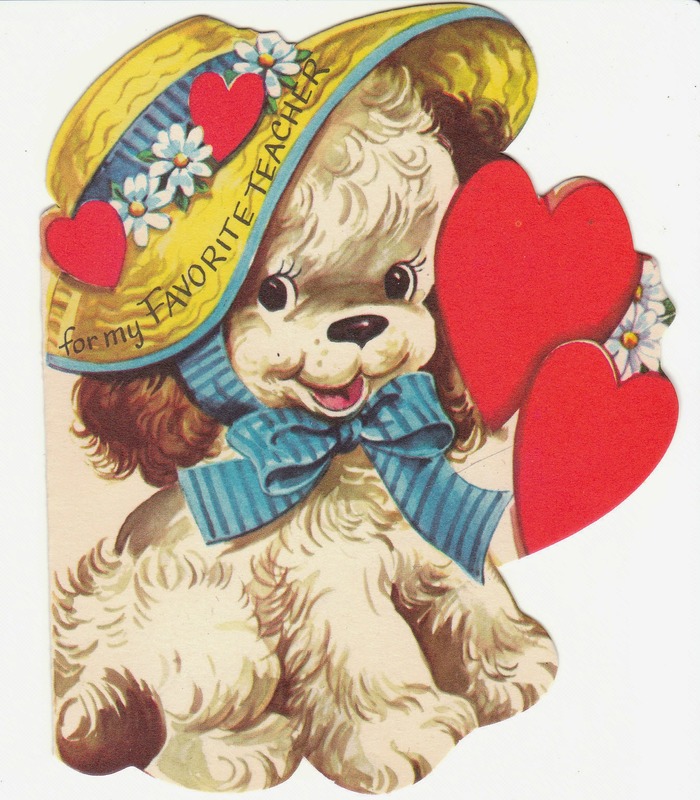 The prize is one vintage Valentine of your choice valued under $10. I will notify the winner on January 23 by email. The winner will have 48 hours to respond to email. You will see all the cute Valentines under $10 at Birdhouse Books by clicking here. Entry is easy with the Rafflecopter form below. Entered! Love the vintage valentines! So precious! Love the vintage look! You've got me thinking about doing Valentines for my son's pre-k class. These cards look so sweet. thanks for the giveaway opportunity! Great idea Trish and vintage Valentines do bring back memories. I love anything vintage! What a great giveaway! Vintage Valentine Card Boy Girl Red Heart Unused with Envelope Die Cut :) cute! I've enetered, and bookmarked you so i can order from you. These are great cards, and I have a sister who would love them! I like the vintage valentine card bunny writer glitter card. Those really remind me of my early 70s childhood Valentine's days! These valentines are adorable!! I love anything vintage! Valentines day is my favorite! I like the monkey dressed up as a mailman. They all are super cute and take me back to the valentines I remember as a kid. I love the "Vintage Valentine Card Farmer Boy 1920s Die Cut for Children"! I love this style the best! Elf Gumdrop, Too cute! Thanks for giveaway! Fingers Crossed! I love vintage valentines. Thanks! I have a dear friend who has exchanged Valentine cards with me since 1947. I wish I could see the look on her face when she gets the one I'm ordering from you. Thanks for the memories. I would pick the vintage Valentine schoolhouse! I'd like to win the Vintage Valentine Card Girl Cuts Out Paper Heart 1958 Die Cut. I think the Vintage Valentine Card Girl Rain Slicker Umbrella Unused with Envelope Die Cut is so cute! Lots of adorable cards! The Vintage Valentine Card Minnie Mouse and Rotary Phone Unused Die Cut Disney is my favorite. Vintage Valentine Card Lion Unused with Envelope 1960's Die-Cut if I won but it's a hard decision. I love the stubborn mule valentine. so cute! The Vintage Valentine Card Dressed Monkey Mailman Postman Hallmark Die Cut is cute. All of these Vintage Valentines are super cute!! I really like the masked thief card and it would be perfect to give to my boyfriend!! Thank you for the awesome giveaway! !